​The Vatican has declared existing and emerging digital technologies as gifts from God to humanity; calling on all Catholics to ensure that the benefits they offer are put to service (Pope Benedict XVI, 2009). How do we answer the Vatican’s call within the context of Catholic education? In a world transformed by digital innovation, Catholic educators need to be “bold enough to acknowledge and embrace [our digital landscape] as a new missionary territory for the twenty-first century” (Zukowski, 2009, p.156). 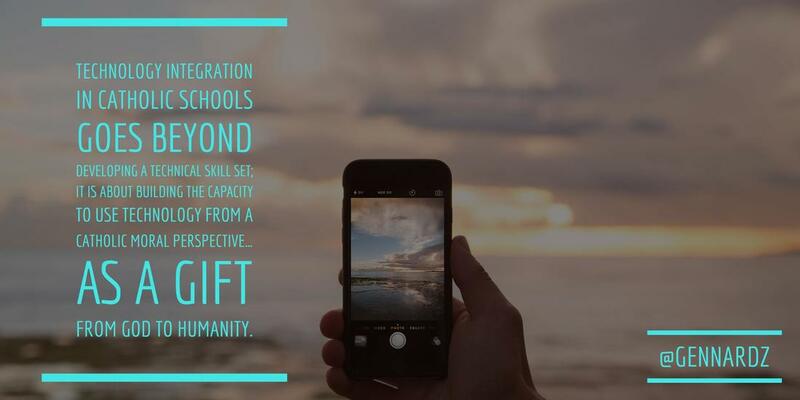 It is imperative that twenty-first century pedagogy is built into Catholic education’s visioning, and that the transformational power of digital technologies is leveraged to enrich our mission. This will require a readiness and willingness on the part of Catholic educators to stretch their pedagogy by stepping outside of traditional approaches to serve our youth, and empower them to enter a wide world of possibility within a digital milieu. If our intention is to have students grow in their faith beyond our school walls, we must form, inform, and transform them into discerning digital disciples; fanning into flame a thriving Catholic presence in a digital age. ​“We can no longer ignore the opportunities that exist for our learners today. Our job is to create a [Catholic] education system that is better than the one we grew up in, as will be the duty of the next generation of educators. We must embrace what is right in front of us” (Couros, 2016). Pope John Paul II (2002) challenged the whole Church, which inherently includes Catholic schools, to “bravely cross this new threshold”, as “hanging back timidly from fear of technology or for some other reason is not acceptable, in view of the very many positive possibilities” (Pontifical Council for Social Communications, 2002). The Vatican contends that the Church needs to understand the Internet (Pontifical Council for Social Communications, 2002); as an integral part of the Church, it is imperative that Catholic educators understand the Internet as well. The dramatic proliferation of new digital technologies in our society ought to have an equally dramatic enhancement in "pedagogical strategies designed to address their ethical and responsible use within a uniquely Catholic framework" (Catholic Curriculum Corporation, 2009). “With or without us, the digital civilization is forming a new way of being human” (Zukowski, 2014). Jesus was known to “keep abreast of what was shaping the culture around Him” (Kandiah, 2015); likewise, Catholic education must keep abreast and play a leadership role in helping students discover what it means to be a Catholic in a digital age. ​Young people, as has often been said, are the future of society and the Church. Good use of the Internet can help prepare them for their responsibilities in both. But this will not happen automatically. The Internet is not merely a medium of entertainment and consumer gratification. 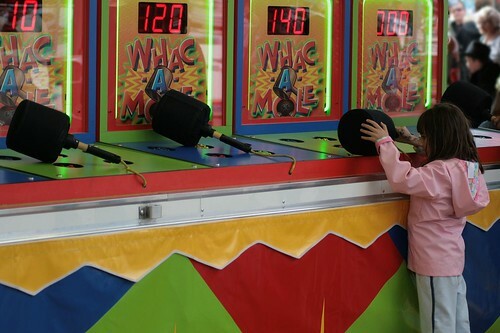 It is a tool for accomplishing useful work, and the young must learn to see it and use it as such. (Pontifical Council for Social Communications, 2002). 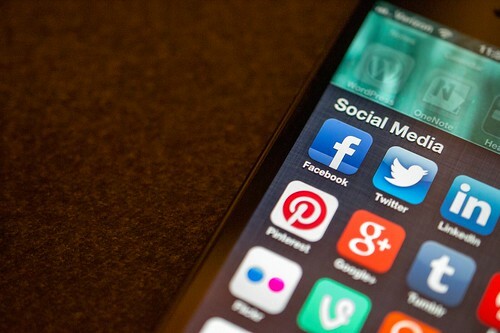 Having the latest smartphone, or being active on Facebook and Instagram, does not denote that students possess the essential twenty-first century knowledge, skills, and virtues for navigating our connected digital culture critically, effectively, nor faithfully. “As society becomes more technologically advanced, students will have increased difficulty finding success [in the future]… unless they possess the skills [and Catholic virtues] to use those technologies appropriately” (Okoye, 2010, p. 3). Even if students never fully adopt the Catholic faith, it is the Catholic virtues that will guide them in their future. Therefore, it is incumbent upon educators to form, inform, and transform today’s youth into a generation of discerning digital disciples. ​Catholic educators have the unique opportunity to “teach boldly the way modelled by Jesus” (Groome, 2013, p.149). In His teaching, Jesus would use examples from everyday life (such as fishing and harvesting); His pedagogy involved connecting His teachings to people’s lived reality. In essence, Jesus’ teaching was rooted in real life, and Catholic educators ought to follow His eloquent example. The lived reality of young people today is that they are immersed in, and are therefore formed by, a digital culture. 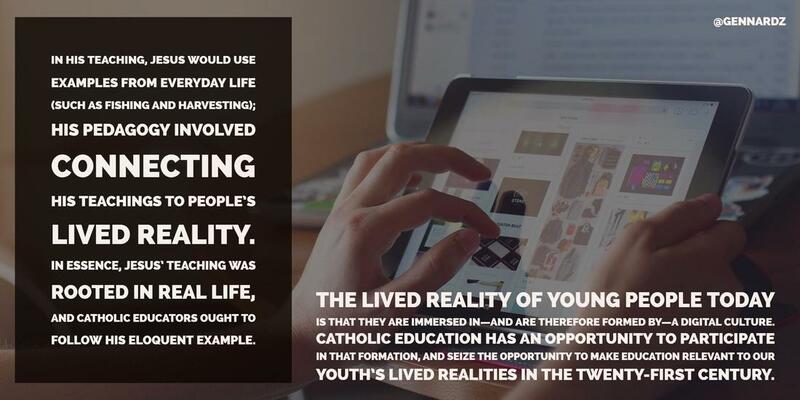 Catholic education has an opportunity to participate in that formation, and seize the opportunity to make education relevant to our youth’s lived realities in the twenty-first century. ​According to a Pew Research study, ninety-two percent of teens report going online daily, and seventy-one percent are active on more than one social networking platform (Lenhart, 2015). Their phones are often the first thing they look at upon waking up, and the last thing they look at before bed. A key area of Pope Francis’ papacy is mobilizing youth, and he is acutely aware of the importance that digital technologies play in this vision (Scammell, 2016). Youth are the future of society and the Church; if we want to reach them, we need to meet (encounter) them where they are. 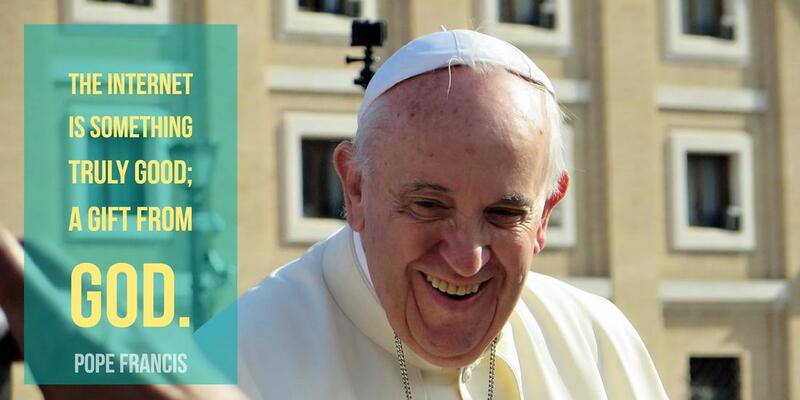 Pope Francis models this digital encounter by being present on social media platforms such as Twitter and Instagram. Likewise, if Catholic education wants to be part of the conversation, it needs to move to where the conversation is taking place, lead by example, and harness the power of technology and social networking to build the reign of God within a digital milieu. ​The Church considers education in the area of digital media and technology not only an opportunity, but a need (Pontifical Council for Social Communications, 2002). This opportunity and need is beyond developing a technical skill set; it is about building the capacity to use technology from a Catholic moral perspective… as a gift from God to humanity. The Church has spoken of the “urgent duty” Catholic schools have to educate youth about Catholic virtues in their social communication and interactions (Pontifical Council for Social Communications, 1971). In today’s digital culture, wherein students are increasingly social in online spaces, and wherein their messages travel faster and spread further throughout the digital landscape, the urgency is even greater. ​Teaching about the Internet and new technology involves much more than teaching techniques; young people need to learn how to function well in the world of cyberspace, make discerning judgments according to sound moral criteria about what they find there, and use the new technology for their integral development and the benefit of others (Pontifical Council for Social Communications, 2002). ​How do Catholic educators ensure they are forming a generation that makes “discerning judgments according to sound moral criteria [online]” and “uses technology for their integral development and the benefit of others”? It starts with moving away from learning about something, to learning to be something: students need to learn how to be digital disciples. In fact, one of the central roles of a Catholic educator—and an integral dimension of the identity of Catholic schools—is to mentor youth toward authentic discipleship. “Simply waiting to react to the next inappropriate misuse of technology is no longer an option if all Catholic stakeholders are to leverage and realize the full potential of these technologies in their schools” (Catholic Curriculum Corporation, 2009). A proactive approach must be taken to equip students with the knowledge, skills, and virtues they need to be discerning disciples within a digital civilization. In Matthew 5:1-12, Jesus speaks to a crowd of people, sharing with them eight special attitudes that we ought to have as disciples of Christ. These special attitudes (known as the eight beatitudes) lead one to experience happiness and blessings from God. If Jesus were to speak to a crowd of young people today, I believe he would encourage the same attitudes he preached about over 2,000 years ago, emphasizing the critical importance of these beatitudes also flowing into their digital lives. I believe the beatitudes are a powerful idea/framework for building discerning digital disciples, which is what inspired me to create the visual below (Digital Beatitudes). It features a host of ethical and moral questions for youth to discern when reflecting upon their use of digital technologies and their demonstration of virtues in online spaces. ​The Internet is a hyperlinked, digital environment, [whose] non-linear structure provides users grappling with a topic or problem the means to ‘surf’ broadly or to dig deeply through links that connect all sorts of text, audio and video resources. This places responsibility for interpretation [discernment] more heavily on Internet users (Lytle, n.d.). ​The responsibility also rests heavily on the educators of these Internet users. As previously mentioned, youth are not digital natives that will automatically resist “the easy path of uncritical passivity, peer pressure, and commercial exploitation” (Pontifical Council for Social Communications, 2000); rather, they need to build their capacity for critical interpretation to make faithful moral judgments and choices. Discernment is an integral part of nurturing informed conscience formation, which is the pedagogical calling of every Catholic educator; this conscience formation must extend to the digital lives of our students as well. ​Society tends to look at the internet as a dangerous place where youth have access to explicit content. Yes, the internet certainly does have a plethora of explicit content… but so does television, magazines, radio, etc. ; even our modern culture in general. The material exists even if we irrationally took the internet away. It is impossible for Catholic schools to block youth from every immoral artifact on the Internet, but it is possible to educate youth about how to faithfully discern and navigate a world infiltrated with this kind of material. In essence, Catholic educators need to view the Internet as “a gift evoking a call”, as opposed to a “threat provoking fear” (Zukowski, 2009, p.156). Catholic schools must provide ample opportunity for students to experience the positive power of digital technologies and reclaim digital spaces for making a positive difference. As youth continue to be immersed in, and impacted by, a digital culture, “success will likely be measured by how effectively Catholic educators can help them to develop and discern what is true, good and beautiful with the human heart, an informed conscience and the critical filter of the Catholic social teachings” (Catholic Curriculum Corporation, 2009). 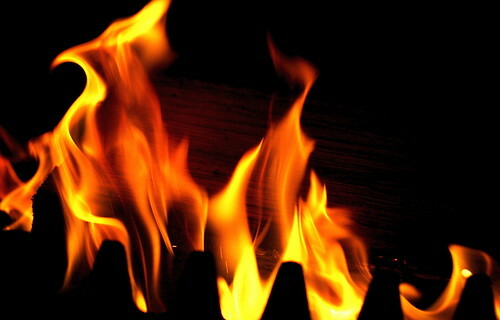 This does not require firewalls, as firewalls are no match for a truly informed conscience. ​Catholic schools need to take the Internet from being an engine for consumption to an engine for virtuous contribution and creation. 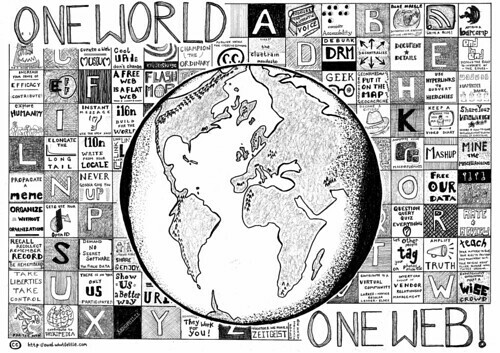 As a global collective, some 3.6 trillion words are composed every day on e-mail and social media (Thompson, 2013). In an overwhelmingly secular culture, how many of those 3.6 trillion words reflect a Catholic voice? Likely not as many as there ought to be. Herein lies both opportunity and need. Some people doubt that their online presence matters and believe the cybersphere is already too abundant with information. Others think that online spaces have an impenetrable dominant voice, deeming online participation pointless. But online presence does matter. 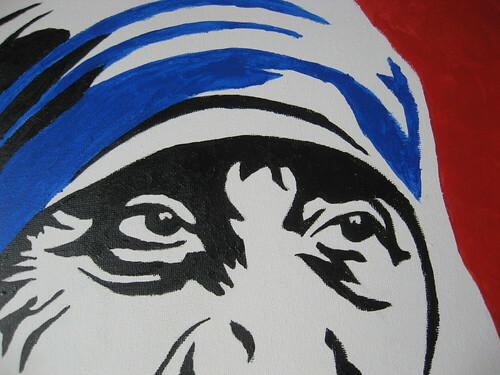 Mother Teresa once said, “We ourselves feel that what we are doing is just a drop in the ocean. But the ocean would be less because of that missing drop” (as cited by Le Joly & Chaliha, 2002, p. 122). 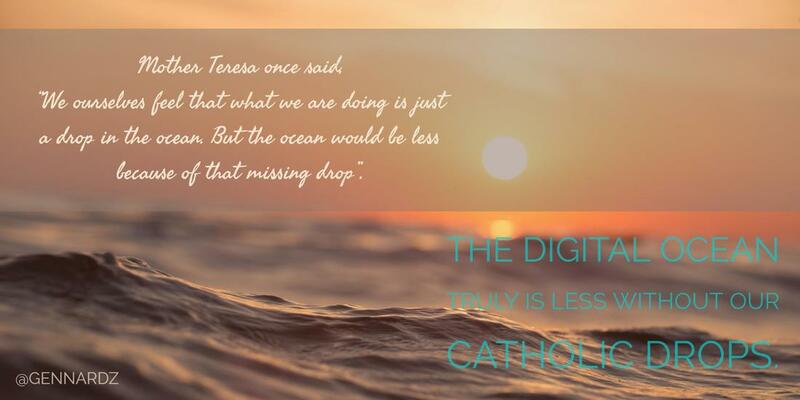 The digital ocean truly is less without our Catholic drops. “The fact that so many of us are writing—sharing our ideas, good and bad, for the world to see—has changed the way we think… and that is accelerating the creation of new ideas and the advancement of global knowledge (Thompson, 2013). If used wisely and intentionally, our youth can also use this medium for the advancement of a thriving Catholic voice and genuine Catholic beatitudes online. 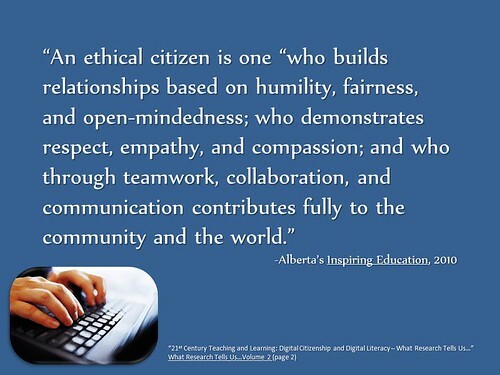 This is why it is imperative that Catholic educators provide opportunities for students to develop their informed conscience, faithful voice and digital literacy, so that they, too, can meaningfully participate in our connected world. ​The two-way interactivity of the Internet is blurring the old distinction between those who communicate and those who receive what is communicated… creating a situation in which, potentially at least, everyone can do both. This is not the one-way, top-down communication of the past. (Pontifical Council for Social Communications, 2002). ​Every voice and every idea matters; even if the audience is small—Catholic educators need to empower student voice in our digital age. Traditionally, youth had a limited voice, as publishing was primarily reserved for academics, authors and journalists. But today, with digital technologies, young people can get their ideas out there—possibly around the globe—and are able to have a voice in a way they once could not. “You don't need to write a book to influence a culture. Your Facebook status, your tweets and… your blog posts could be a means by which you are able to offer up a Christian perspective on life, culture and justice” (Kandiah, 2015). Catholic education needs to embrace this new reality and what it affords our learners and our faith! ​Consider...the positive capacities of the Internet to carry religious information and teaching beyond all barriers and frontiers. Such a wide audience would have been beyond the wildest imaginings of those who preached the Gospel before us... Catholics should not be afraid to throw open the doors of social communications to Christ, so that his Good News may be heard from the housetops of the world” (Pontifical Council for Social Communications, 2000). ​Pope Francis (2014) has praised the Internet for being a medium for Christian witness that can reach the peripheries of human existence, and had said, “By means of the internet, the Christian message can reach ‘to the ends of the earth’ (Acts 1:8)”. Again, the Internet is a fundamental aspect of the lived reality of youth today; “preparing students to enter this Internet frontier grounded in the Catholic ethos, digital dialogic skills, [and the beatitudes] enables them to be witnesses, if not missionaries, of sorts, in the new [digital] cultural context” (Zukowski, 2009, p.159). 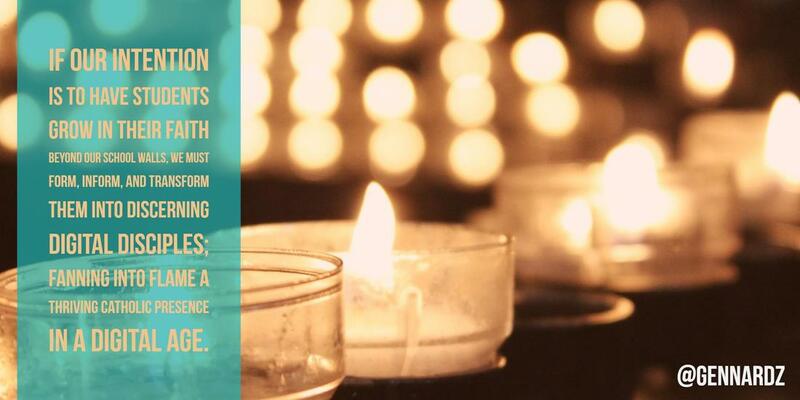 Furthermore, for those youth who have lost or fallen away from their faith, a thriving Catholic presence online could be a place where they receive daily reminders of God’s unconditional love, forgiveness, and mercy. ​Catholic schools also need to focus on leveraging the Internet to build community. Pope Francis (2014) professed “It is not enough to be passersby on the digital highways, simply “connected”; connections need to grow into true encounters… The digital world can be an environment rich in humanity; a network not of wires but of people.” The Internet offers Catholic schools unprecedented opportunities to reach out and connect their students with people outside of their immediate communities, presenting the “remarkable capacity to overcome distance and isolation, bringing people into contact with like-minded persons of good will who join in virtual communities of faith to encourage and support one another” (Pontifical Council for Social Communications, 2002). 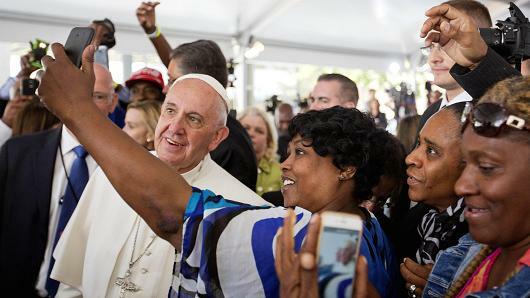 Pope Francis (2016) has further acknowledged the immense potential that social networks offer in facilitating relationships, encounter, solidarity, and promoting the good of society. These encounters through digital connections can also empower students to advance social justice both locally and globally. “When students are able to listen to the people directly affected by development issues, they are more likely to engage them as equal partners in the quest for social justice and equality, than the passive recipients of charity" (Catholic Curriculum Corporation, 2009). Digital technologies, for all intents and purposes, can act as a catalyst to bring humanity closer together; promoting peace and justice in our connected, yet broken world. This post ends in a prayer; a prayer for Catholic education to embrace digital technologies and become a model for the future of education. 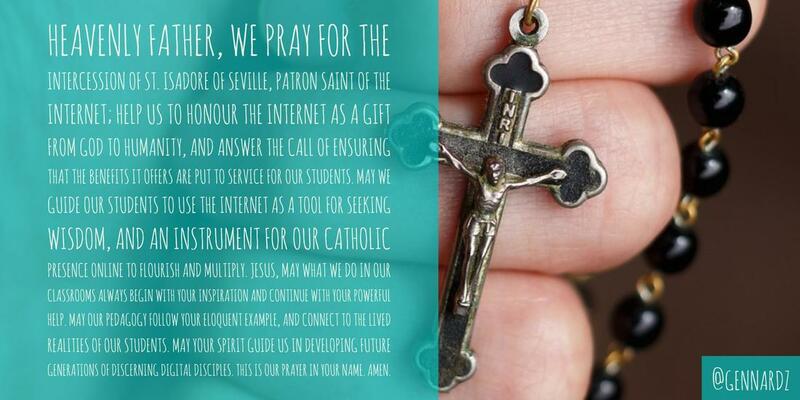 Heavenly Father, we pray for the intercession of St. Isadore of Seville, patron saint of the Internet; help us to honour the Internet as a gift from God to humanity, and answer the call of ensuring that the benefits it offers are put to service for our students. May we guide our students to use the Internet as a tool for seeking wisdom, and an instrument for our Catholic presence online to flourish and multiply. Jesus, may what we do in our classrooms always begin with Your inspiration and continue with Your powerful help. May our pedagogy follow Your eloquent example, and connect to the lived realities of our students. May Your spirit guide us in developing future generations of discerning digital disciples. This is our prayer in Your name. Amen. My reason for taking the opportunity to learn Spanish was deeply rooted in personal connection to the language. Spanish is my husband's first language, and we hope that our daughter will be bilingual as well, so she can meaningfully communicate with both sides of her family, as well as open up opportunities for her future. Prior to this learning experience, the responsibility for ensuring our daughter develops her Spanish language fell solely on my husband, as I would have been more harm than good in trying to teach her Spanish. 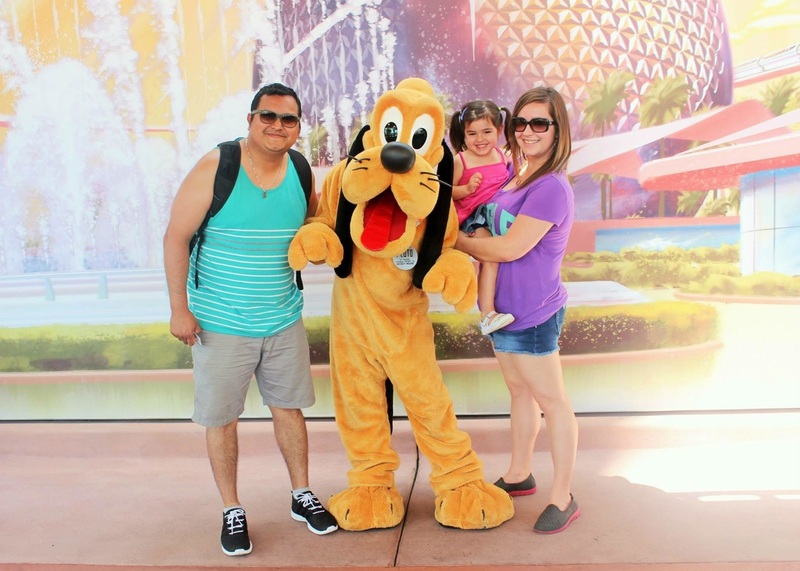 I wanted to play a more active role in raising our daughter to be bilingual. At the beginning of this learning experience, my Spanish was extremely poor, and it was because of this project that I actually said this out loud. I knew within myself how poor my Spanish was, but I felt very ashamed for others to know, as I lived in Mexico and have been married to my husband for over 5 years, and I knew I should have had a more solid foundation of the language. Through the process of this learning journey, I discovered that the biggest obstacle to my Spanish learning and growth was ME... because I let my shame and self-consciousness dominate and I didn't even try to speak. Having this opportunity in EC&I 831 to learn anything we wanted was a gift; I felt empowered to finally be given the time and space to work on something so in need of my attention and effort. I started with Duolingo, a language learning app/site. Duolingo helps you with goal-setting, increases your vocabulary, and gets you to focus on comprehending phrases (as opposed to just singular words on flashcards). I also loved how "convenient" it was, that when I had some moments of down time, I could practice my Spanish, as the lessons were short and sweet. I was really motivated to see my scores climbing rapidly at the beginning. About 5-6 weeks into the learning project, however, my score was plateauing, even though I kept working on the app and meeting my daily targets. Although I know it's not about the score or number, I can admit that I was getting frustrated, but I stuck with it. I definitely say that the app helped me, but I needed to engage with more than just one tool to keep propelling my learning forward. I also changed the language setting on all of my technology (my PC, my MacBook, and my iPhone) to Spanish. I felt this was a good option, since I am on my technology so much, to immerse myself further in the language. It was quite tricky at times, and I had to refer to translators from some things, but i do believe it benefited me in this process. Next, I decided to label a bunch of objects in my house. The rule was, that if the object was labelled, my husband would no longer use the English word with me. At first I was incredibly frustrated, as it slowed me down immensely (i.e. cooking dinner and he tells me the "cuchillo is in the lavaplatos"). However, with time, I relied less on the visual supports (post-its) and started to pick up on the words because I was using them more regularly. I also found myself using those visual supports to give my daughter basic directions in Spanish, which is something I've never done before (i.e. "Mayte, put this in the basura, por favor." The Post-its are still up in my home (good job, Post-its on your adhesive technology! ), and I think I will keep them there until I no longer need them. 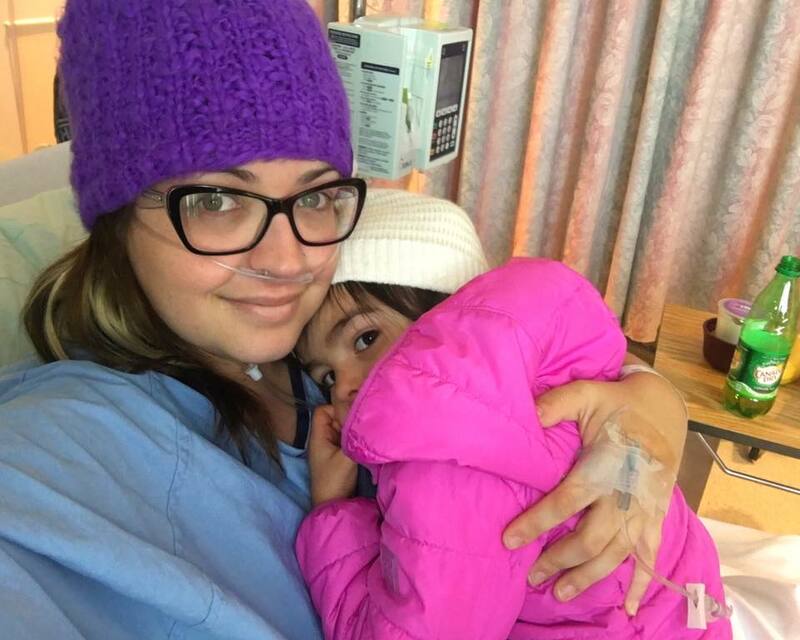 Up until this point, I was still too self-conscious to speak out loud in Spanish, especially so publically through YouTube or a blog… then I found myself admitted to the hospital, diagnosed with a terrible and debilitating neurological disorder. I couldn't see my daughter while I was in the hospital, as I was unable to care for her and my husband needed to be at work. Thank goodness for my amazing parents, who cared for Mayte in Moose Jaw during the time I was in the hospital. I found myself very down in the hospital, not being able to hug Mayte, read her stories, or put her to bed. It was likely the high dosage of morphine and other pain killers I was on, but I asked my husband to bring Mayte's Spanish story books to be one evening when he was done work. I had never read these books to her, as I was always scared I would confuse her or do more harm than good in her Spanish language development, but since I missed her terribly, I wanted to record a video of myself reading these books to her. While I know my speech was slurred and I mispronounced words, it was so heartwarming to hear that Mayte was watching the video again and again in Moose Jaw. That risk I took, combined with the motivation of the learning project, connected us when we couldn't physically be together. I engaged with another language learning tool created by the BBC, called "Mi Vida Loca". The interactive video program consists of 22 episodes that are divided into specific topics. The videos make you feel like you are a part of the action. I managed to finish the program during the course of the past 10 weeks. I can definitely say the program enhanced my vocabulary, which is key to improve my Spanish speaking. Screenshot of the Mi Vida Loca banner. Click on the picture to be directed to the Mi Vida Loca home page. There were some low points during my journey where I just felt like I wasn't meeting the expectations I had upon commencing my learning project. I just hadn't had that experience of fluency in my speech--it was so choppy, lacked subject/verb agreement, and had so many mispronunciations. 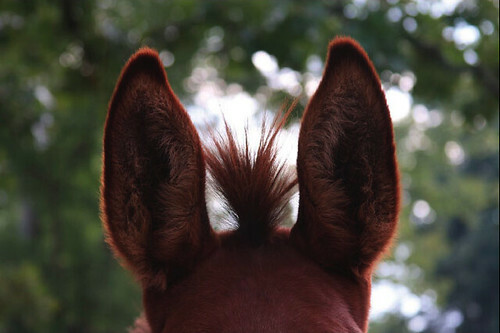 When expressing my upset to my husband one day, he responded by saying something very obvious, yet profound… he said, "Genna, we have two ears and one mouth for a reason." He told me to consider our daughter for example, she is admittedly behind other children her age in terms of her verbal fluency in both English and Spanish. He said that she's still taking it all in, processing it, testing it, and in time, she will find her voice and develop her fluency. I had to sit back and reflect on this for a bit and think about how I could use my two ears to develop my Spanish fluency. I started reading about how singing in another language can increase fluency, and I then came up the crazy idea to try it myself. I was extremely nervous about posting this online for others to see, but that's part of what this open learning process is about. My highlight from that "risk" was that, for the first time in my entire life, I got to experience verbal fluency in another language. Granted, the words were not mine; but I've never been able to speak more than one very basic sentence fluently. Through singing, I was able to speak fluently for three and a half minutes…multiple sentences--it felt so empowering and I was able to let go of some of my self-consciousness! After the first week, I realized that I couldn't just learn on my own--I needed to get connected. From the onset of my learning project, I began to build a PLN for my Spanish language learning. I used a variety of networking tools, but my favourite were Mixxer and Linqapp. They are free platforms to make connections for language exchange. From the connections I made on these platforms, we connected on Skype, which has been an incredible tool for language learning. I've had rich learning conversations via text chat and video chat with native Spanish speakers around the world who were also interested in learning English. It was a great experience to learn one language and teach another simultaneously. ​I also used Twitter to connect with others. I added certain hashtags to my TweetDeck and HootSuite, including #educachat, which is conversation and sharing space about education (like #edchat) in Spanish. It was pretty amazing to get some of my tweet retweeted in this space! My highlight was connecting with a Spanish speaker who has the same Tech Coach role as I do. It was awesome to not only be learning a language, but be able to discuss a shared passion for educational technology in Spanish as well! It took our interactions beyond "basic" conversation. Motivated by Roman philosopher, Seneca, who said, "While we teach, we learn," I decided to apply this concept to my learning project. Research supports the idea that teaching is a powerful and fruitful way to learn, so I decided to "teach" something in Spanish to support my learning of the language. I decided to do a recipe video, but give all the instructions in Spanish. This was an incredibly difficult task, in terms of translating and targeting my speaking, pronunciation, and pacing. I was able to draw upon the help of my PLN to support me in this undertaking. I was shocking to see all the hours of work condensed into 3 minutes, but it reaffirmed why the process is infinitely more important than the final product, which is something we need to continue to instill in our classrooms. I've learned so much through this process! My Spanish has drastically improved. Am I fluent? No way! However, this project has given me tremendous confidence to keep going in my language learning journey! I've also learned that open/visible learning keeps you accountable. I appreciated this, as I have given up on learning Spanish many times before out of frustration or a sense of hopelessness. Open learning also allowed me to connect with others who could truly support me--which is something I hadn't tried in previous attempts to learn Spanish. I got to drop that sense of isolation in learning a language, and feel like a true member of a Spanish learning community. I also learned how reciprocal open learning and PLNs can be, as while in the process of learning Spanish, I was also able to help others with their English. I learned a ton about strategies that support language learning, that I wouldn't have otherwise learned, as I was previously so focused on learning "Spanish", that I didn't delve into learning the process of language learning. In essence, this project has allowed me to learn how to learn. This learning project allowed me to focus and reflect on process, which is a rarity in graduate studies. We are always so focused on our end-products (the research papers, the presentations, etc. ), that we often neglect to spend time reflecting. I appreciated how open-ended this project was, as I wasn't trying to carve my end-product to be just what the instructor wanted, but rather, my project got to be whatever I wanted, and most importantly, the learning was truly for--and driven by--me. Move over Rachel Ray... Make way for Genna Mae! Just kidding! (And yes, that really is my middle name)! Roman philosopher, Seneca, once said "While we teach, we learn." Research proves that "teaching is a fruitful way to learn", and it was this logic that motivated the next step in my learning project. I wanted to "teach" something in Spanish in order to support my learning of the language. This endeavor proved to be much more difficult than I originally expected, but I can say with certainty that the results were much more fruitful than I expected! A couple weeks ago, I took a big step in my learning project by singing in Spanish. It was an awesome experience, and this time I wanted to challenge myself further. While singing, I memorized lyrics written by someone else (which was no easy task); but this time, I created my own script, which proved to be much more time-consuming and challenging (hence why it took me almost two weeks to get this post together). I decided to create a script about something I know. Inspired by classmates Ellen Lague and Justine Wheeler's cooking/baking blogs, I decided to create a script about one of my favourite recipes: Agua Chile. 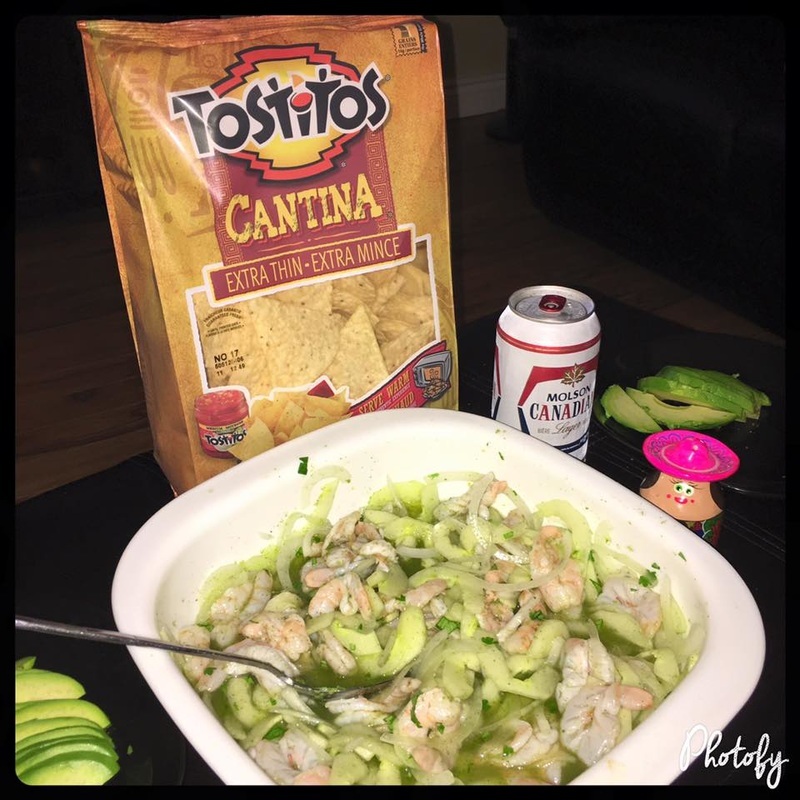 Agua Chile is a Mexican ceviche with a spicy kick. I wanted to accompany my speaking with a video of me preparing the recipe so that even if you aren't a Spanish speaker, you can still follow the recipe. ​It took me a considerable amount of time to work on my pronunciation for this video. For pronunciation, I referred to Rocket Languages, my PLN, and my husband. My speaking is still quite choppy, but I'm pleased with my progress. Below is the result! It is still quite shocking to see two weeks of work condensed into a mere 3 minutes and 16 seconds. However, it illustrates why the process is infinitely more important than the final product! ​I have been spending quite a bit of time using BBC’s language learning program that I began once I decided upon learning Spanish for my learning project for EC&I 831. This week I would like to share a little bit about it with you and also formally recommend it to other classmates who chose to learn a language for their learning project, or who are simply interested in language learning. By Flrn at English Wikipedia. [Public domain], via Wikimedia Commons. The BBC offers their interactive program in several languages, including French, Spanish, Italian, German, Greek, Portuguese and Chinese. Of course, I have been engaging with the Spanish program, entitled Mi Vida Loca, which happened to be the 2009 winner of Interactive Innovation in the British academy of Television Craft Awards. The interactive video program consists of 22 episodes that are divided into specific topics. The videos make you feel like you are a part of the action. Each episode is also accompanied with supplementary materials that include the key vocabulary, an explanation of the grammar structures, and extra practice. ​The site even discusses how this program can be used in the classroom and they have a site dedicated to Teaching with Mi Vida Loca. The site says, “If you have the right set-up, such as an interactive whiteboard or a projector with speakers, you could use it for whole class teaching… If you don't have access to a computers or whiteboard, then Mi Vida Loca can be used as homework to either prepare for or reinforce classwork.” While I’ve never taught a language class, I could see how this program could be integrated into the classroom, particularly through role playing. ​I’m now almost half way through the program. I am definitely enjoying it, but one thing I struggle with is that the program is only offered in European Spanish and not Latin Spanish. My learning project is focused on Latin Spanish, so sometimes I find myself missing some of the words, as the accent is considerably different on certain letters i.e. the “c” is pronounced as “th” in the program, while “c” is pronounced as “s” in Latin Spanish. That being said, I’ve adapted to this and just listen more carefully. I can definitely say the program has enhanced my vocabulary, which is key if I want to improve my Spanish speaking. ​In today’s increasingly digital age, young (and not-so-young) have a plethora of digital networking tools at their fingertips. Felicity Duncan, in her article Why Many Kids are Leaving Social Networks, discusses how many teens are increasingly picking up more intimate networking tools such as group texting, iMessage, WhatsApp, and Snapchat. Duncan highlights three main reasons for this increase in more intimate networking tools. What follows in my insight on each of these reasons. Close family members can see their activity… perhaps activity they do not want their family to see. I only partially agree with this reason. It is possible to adjust your posts to block certain people from seeing certain things. If teens don’t want their family to see their Friday night photos, they certainly know how to use the audenice selector to block their family, while sharing with their friends. On the other hand, there is big question about digital citizenship here. If teens are posting things they don’t want their families to see, they certainly need to engage in further discussion about what is appropriate to post online. Again, this illustrates the imperative role educators, families, and larger society plays in educating about and modeling sound citizenship in both online and offline spaces. Permanence and ephemerality… Duncan states that teens turn to tools like Snapchat because of the non-permanence and the perceived relinquishment of responsibility to protect their digital dignity. Again, I only partially agree with this. First of all, students should demonstrate digital citizenship no matter how long their digital artifacts last… 6 seconds or 1000 years. Furthermore, nothing just “disappears”… it is always possible that someone can take a screenshot (in some apps the sender is notified)… BUT the receiver could also snap a picture of their screen with another camera, etc. We need to impress upon youth that even though certain networks are 1:1 or close-knit, there is still the possibility for permanence. On the other hand, “In a world where forgetting is no longer possible, we might instead work towards greater empathy and forgiveness”, which is something that Alec Couros and Katia Hildebrandt explore in their joint blog post entitled (Digital) Identity in a World that No Longer Forgets. ​Duncan then explores the implications that moving from broadcasting to narrowcasting has on business and the public sphere. One thing she mentions is that “parents who may be accustomed to monitoring at least some proportion of their children’s online lives may find themselves increasingly shut out.” I only partially agree with this statement. 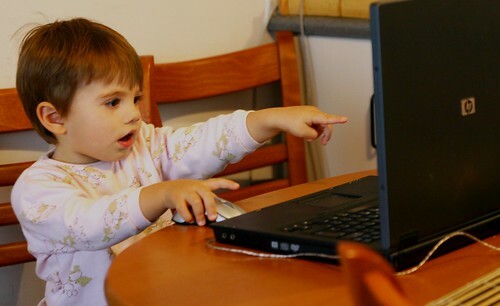 While I think it is definitely important to connect with your child online, I would hope that the monitoring of their child’s online life isn’t restricted to online monitoring. What I mean by this is that parents MUST talk to their children about what they are up to BOTH offline AND online. 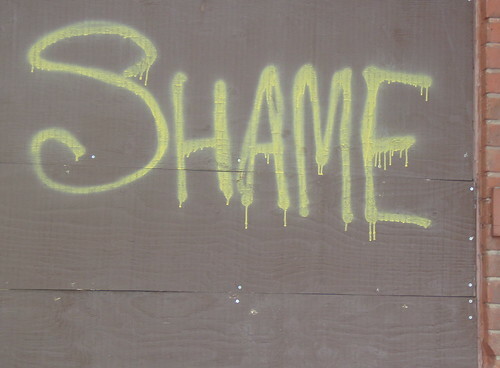 We can’t rely on digital tools alone to monitor the online lives of our youth. 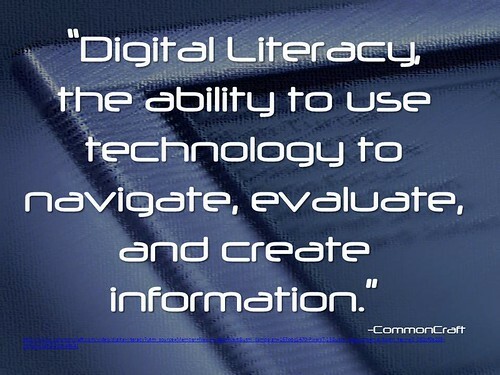 We can never diminish the value of talking and being actively engaged in our children’s (digital and non-digital) lives. ​Another implication that Duncan cites is the increase of group text and Snapchat (and the perceived exodus of young people from broadcast social media) will decrease the opportunity for new ideas to enter their networks. While Duncan has a very good point here, I would argue that we can’t rely on social media alone to expose us to new ideas that challenge our current beliefs, as those tools, too, have algorithms that can, to some degree, satisfy our filter bubble as well. Furthermore, people may only friend and follow others with similar interests and beliefs… or block or turn off notifications that misalign with their personal beliefs. What I am getting at is that narrow/partisan views aren’t caused by intimate networks like Snapchat and iMessage… what they are caused by is a lack of skill in developing one's open and critical lens. Navigating the World Wide Web (as well as televised, radio, print, blogs, Ted Talks, etc) requires this open and critical lens, and can also allow us broaden our exposure to new ideas and challenge our current beliefs. Yes, we have social media (which I am a definite advocate of), and it does create a “powerful and open public sphere, in which ideas could spread and networks of political action could form”; but that being said, if youth are never taught or granted opportunity on HOW to leverage social media TO spread ideas and network with others for action, then it is not Snapchat nor iMessage that is the culprit. This is why we must cultivate contemporary skills in our youth, preparing them for the world before them and not the world that was once before us. ​Duncan also discusses that broadcast social media has turned into merely consumption for teens. Again, I have to wonder if this is a result of what has been modelled for them and a lack of purposeful opportunity both at school and at home to move beyond consumption and into creation. That being said, I think we have to be careful about this idea that consumption is inherently bad. The key is BALANCE. If we don’t at least consume a little, how are we to create? We need to build upon the ideas of others, and we do that by first consuming their ideas. For example, each week in this class, we are consuming… we read articles, watch videos, and attend a 1.5 hour virtual meeting… these things INSPIRE us to create blog posts, videos, etc. Classmate, Logan Petlack, is a great example of this, as, through his consumption of this information, was inspired to create a Snapchat story the next day at school. If we do not engage in the consumption process, our creation process is likely to be less informed. Another example is the whole remix culture; from consumption comes an incredible amount of new creativity inspired by the creativity of others. Again, it is all about balance; if students are more concerned with keeping up the Kardashians than keeping up with the wider public and political sphere, there is a problem. We (as educators, parents, and society) need to empower youth to take interest, broaden their [dare I say it] consumption, and inspire creation. ​Ultimately, there is a time and place for networking through broadcast social media and through narrowcasting social media. Some stories are more suited for an intimate audience, while others can inspire a larger audience. If educators, parents, and society can educate about and model appropriate and effective use, perhaps we can empower youth to capitalize on the benefits of both modes of networking, to both serve themselves and others. For a comparison of broadcasting and narrowcasting, click here to view an infographic on Flickr. While my future is a big question mark at this point in time, as doctors continue to develop a plan for pain management (and possible pain elimination through surgery), presently I am taking anti-convulsive (anti-seizure) medication and heavy narcotics to manage the pain. As a high achiever, I have been very worried about my two graduate-level courses I am taking this semester, but I feel fortunate to have such kind and understanding professors like Alec Couros, Katia Hildebrandt, and Fr. John Meehan, who are willing to work with me and my condition to see me succeed. Thank you... my gratitude is beyond what I can adequately express. While the pain has no words, the most difficult part of this whole ordeal has been being away from my daughter. Going days on end without hugging her is the greatest pain of all. That being said, I am eternally grateful that my parents in Moose Jaw have been able to take her and care for her while my husband, Luis, balances his busy job and spending time with me in the hospital. Although I continue to be very weak, to demonstrate progress on my learning project this week, I decided to make it both practical and personal. As you have read in my previous posts, I am extremely self-conscious about speaking in Spanish. This week (maybe it's the drugs that the nurses are putting in my IV that gave me a confidence boost), I decided to read some picture books to my little girl. 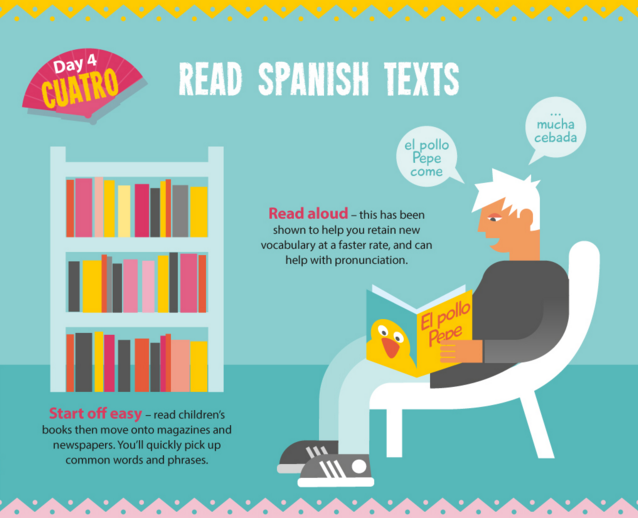 While I read to my daughter every night, I have never read to her in Spanish... ever. This is a big step for me. Coincidentally, the literature on language-learning also promotes reading children's books as a way to increase fluency. What you see below is a video of me reading bedtime stories to my little girl, as I am unable to be there in person to read them to her. Please forgive my delayed/slurred speech... some of it is the Spanish and some of it is the pain medication. My parents tell me that my daughter continues to watch the video on repeat, which melts my heart. I continue to be amazed by the way technology can bring people together and enhance relationships. Sorry for the short post this week, as I regain my strength, my posts will improve. Thank you for your understanding. I hope to get released from the hospital this week as well! Photo Credit: Thomas Cook via Pinterest. Click on photo for link to source. I'm happy to share that I have made more progress this week on my learning project! I continue to use Duolingo, and have now reached 46% fluency (according to the app). I'm not at all pretending to believe that this is an accurate measure, as there is no way I'm 46% fluent, but I don't pay attention to that... for me it's just about progress and documenting my learning. What I appreciate most about this app is the ease of doing a lesson here or there on my phone when I have time in my day... it doesn't require me sitting down for a set amount of time; I get to define when, where, and how I use it. My speed of progress on the app has slowed down as the lessons have become more and more difficult, but nevertheless, I continue to plug away. Why? Well, ultimately, I ask myself if the tool I am using is helping or hindering my personal learning. I can definitely say that it has expanded my vocabulary, so therefore, it is helping. That being said, I do not equate "helping" to be the same as "enriching". I personally choose to continue with the app in order to expand my vocabulary. Again, I stress that the numbers the app produces are not what's important, nor are they representative of my true learning journey. This app is but one small strategy in a gradually increasing mix that will support me in my journey towards Spanish fluency. 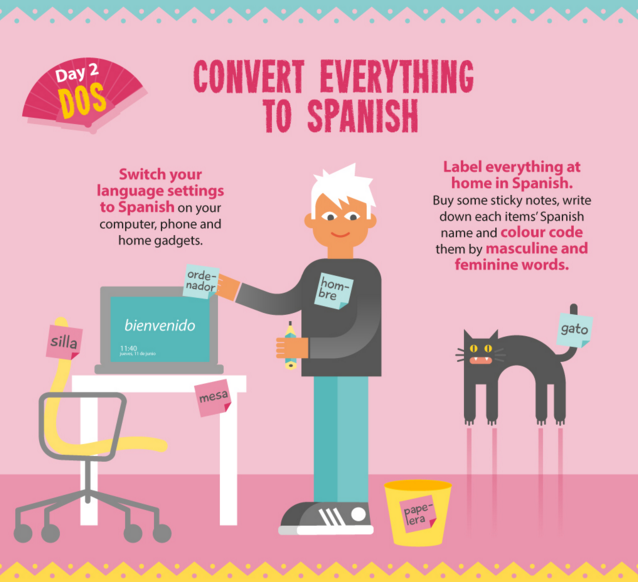 As per my original post on my learning project, I have taken on two more strategies to support my learning of the Spanish language: 1) setting the primary language as Spanish on all my digital devices, and 2) labelling things in my home to help build my vocabulary. Below you can watch how I changed the language on my PC, MacBook, and iPhone from English to Spanish. I think this is a good strategy for me because I spend so much time on my devices, that it's another way to immerse myself in the language. I will also note that both videos I made this week were made iniMovie using Spanish as the default language! It was tricky in spots (i.e. remembering what menu item was what), but I am proud that I managed to do it. Although the video below is only 4 minutes, the time it took to look up each word, determine if it was masculine or feminine, sort the words, write the words on Post-its, memorize the words, and then post them around my home, took considerably longer than four minutes! In any case, I hope you enjoy my fun little Post-it video! “Altogether, we compose some 3.6 trillion words every day on e-mail and social media”. A common question I’m often asked is: why should I blog, join social media, or even create a digital footprint? Some people doubt that their online presence matters and believe the cybersphere is already too abundant with information. Others think that online spaces have an impenetrable dominant voice, deeming online participation pointless. Because Okolloh was thinking out loud, and because she had an audience of like-minded people, serendipity happened. ​The ocean truly is less without our drops. As Clive Thompson says, “The fact that so many of us are writing — sharing our ideas, good and bad, for the world to see — has changed the way we think… and that is accelerating the creation of new ideas and the advancement of global knowledge.” This is why it is imperative that we, as teachers, provide opportunities for our students to develop their voice and media literacies so that they, too, can meaningfully participate in our connected world. Thomson mentions that historically, literacy has been focused on "reading, not writing... consumption, not production." Dave Cormier elaborated on this during class on Tuesday night, saying that “knowing” has erroneously become “content”. In an age of digital communications, our role as educators is to transform this simple way of “knowing”. It is imperative that “knowing” be flexible, embracing of diverse ideas and perspectives, adept at making valuable connections between ideas, adaptable for changing ideas to fit new contexts, able to create new meaning… and most importantly, to be a complex, lifelong process wherein the “community becomes the curriculum”. If we believe in this way of “knowing”, we create fertile soil for rhizomatic learning to bloom. ​Keeping with the theme of learning’s continuity with nature, I also came across an intriguing article in the New York Times this week, wherein a German forest ranger contends that trees have social networks as well. In some ways, we can look to trees as a model of learning in a globally connected world. Screen clipping taken from article. Click on picture to read the full article. The cognitive shift in going from an audience of zero (talking to yourself) to an audience of 10 (a few friends or random strangers checking out your online post) is so big that it’s actually huger than going from 10 people to a million. When I began to flatten my classroom walls, I truly grasped this idea. The audience does not need to be massive to be authentic, nor to have an impact. During the past couple weeks, I have realized this all over again. A teacher approached me before Christmas to chat about her upcoming unit in Grade 2: sending and receiving messages. In past years, her students would get designated a pen-pal from across the hall, and they would exchange letters (messages) back and forth. This year she was looking to enhance this unit by incorporating 21st century literacies. Enter FlipGrid! We decided to extend communication beyond the school walls as well, by connecting with Grade 9 classroom in the city. Although the audience is small (two classrooms who can see each other’s collection of messages), the teacher has already observed a significant difference in the quality of the messages and student motivation. When I went to the high school to help the Grade 9 students get started in responding to the messages from their Grade 2 e-pals, I was in absolute awe at how excited and motivated the students were... they genuinely care about the project! An "authentic audience", along with meaningful BYOT, enhanced the students’ engagement and sense of empowerment. You might be wondering how this can relate to Christian Ethics for the Grade 9s… The students are exchanging messages back and for the entire month of February and a portion of March, three times per week. Each week, the Grade 2's will receive a Christian challenge from their Grade 9 e-pal, and the subsequent messages will involve dialogue about faith and service, as well as getting to know their e-pal on personal level. 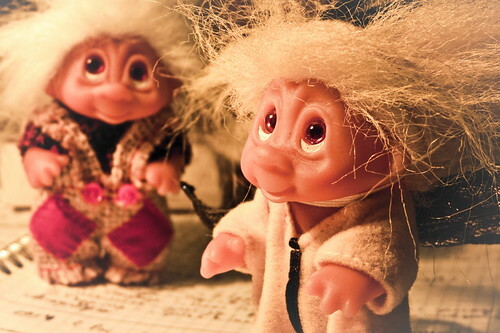 Using digital communication, students (as young as 7 years old) are learning how to connect and communicate with authentic audiences in online spaces, in positive ways. This activity integrates some the knowledge and skills of the Ministry’s Digital Citizenship Continuum as well. I am so excited to be supporting this project and I am looking forward to watching it unfold. I have included two videos below (using just the audio), where you can hear the initial message from one of the Grade 2 students, and the response from their Grade 9 e-pal. I have also included the Grade 2 outcomes that we are targeting. The project may seem small... however, if students are not afforded opportunities in school to use digital technologies in positive ways, to authentically connect with others, and to develop their voice, then I contend that we have failed to set them up for lifelong learning and success outside of school walls. Excerpt from Clive Thompson's article. Click on the excerpt to read the full article. The above story is tragic, indeed. Because Duchesne was young, he really had no way to get his ideas out there. Now, with digital technologies, young people CAN get their ideas out there, and are able to have a voice in a way they once could not. We need to embrace this new reality and what it affords our learners. It is largely up to educators to develop students' capacity to authentically connect with others, share their ideas, invite response, and collaboratively create new ideas, because students are not digital natives. But it's not only students who need to get connected and share ideas... in today's globally connected world, all educators ​must as well. "When inventive people aren’t aware of what others are working on, the pace of innovation slows." Just consider for a moment the impact that this slowing pace of innovation (as a result of disconnected teachers) can have on education. As Clive Thompson says, "Failed networks kill ideas, but successful ones trigger them." The impact is profound. When you can connect people... ideas flourish and multiply. Ideas flourish and multiply for those educators who are making efforts to build their PLNs. It is imperative that teachers get connected; and this is what our EC&I 831 course with Alec and Katia is empowering us to do. So... back to those questions at the beginning of my post: why should I blog, join social media, or even create a digital footprint?... because the Internet is now "the world’s most powerful engine for putting heads together"... and we MUST use this powerful engine to connect minds if we are to provide the best possible education for youth today and tomorrow. Ultimately, as Michael Drennan reminds us, "schools are for preparation to enter a wide world of possibility." Our world is connected in ways that were once inconceivable. Digital technology and social networking is transforming the way we learn, and consequently, transforming the role of the teacher. While some teachers may feel as if their role is becoming obsolete, I would argue that our role is now more critical than ever... it just looks different. "Learning is a continual process, lasting for a lifetime"; it does not stop once a piece of paper is handed to you during a graduation or convocation ceremony. 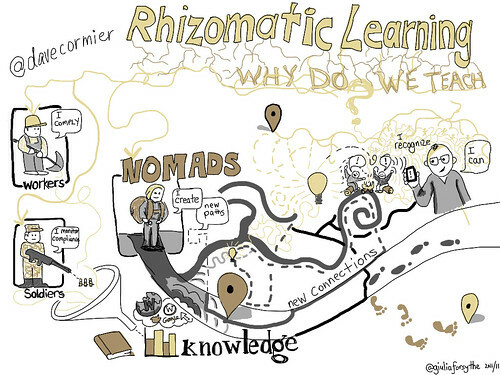 Connectivism in a modern theory of learning that educators must embrace. As my classmate, Nathan Bromm stated, connectivism is the new lifelong learning. In order to learn authentically in our contemporary society (and be prepared for tomorrow), students need to be able to develop 21st century literacies, which include connecting and collaborating with others, as Howard Rheingold argues in his article. We, as teachers, have the opportunity to make a profound positive impact on the futures of our students if we choose to embrace this change... otherwise, we leave our students prepared for the future that once awaited us, but unprepared for the actual future that awaits them. This requires us to ditch the idea that learning is a transaction between the teacher and the student… it requires us to regard learning as the meaningful interaction between the student and their evolving Personal Learning Network… cultivating lifelong learners in a world where, as George Siemens points out, "Knowledge is growing exponentially… [and] the life of knowledge is now measured in months and years". But how do we get their attention?!? As Rheingold states in his article, he used to feel as if attention was compromised when students were not looking at him while he was talking to them; but then he realized… "If I can't compete with the Internet for their attention, that's my problem." Not accepting this reality, schools (and even post-secondary institutions) have even gone so far as to ban technology in their classrooms because they think technology is inherently distracting. A Forbes article on the issue says that, "some professors feel they need to create engaging presentations to compete with technology for students’ attention." 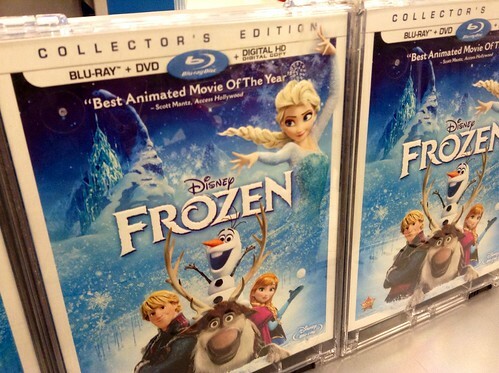 Does it have to be a competition? I do not believe so. We, as teachers, have had it engrained in our minds that in order to have students' attention and make learning meaningful, we need to be "engaging"… but this pedagogical mindset is flawed. 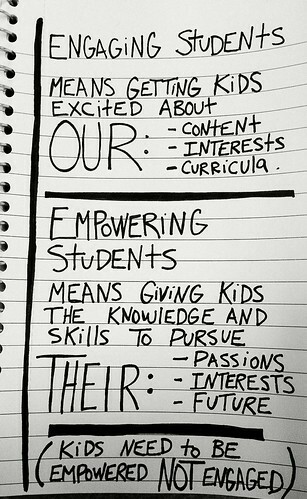 George Couros talks about the importance of shifting from engagement to empowerment. I believe empowerment is what truly captures the "attention" of students. A participatory culture of connected learners is empowerment. Rheingold's article illustrates that engagement is not the key to attention… nor is it the key to authentic learning. He, argues that a commitment to developing 21st Century literacies is the key to authentic learning. Rheingold, too, advocates for empowered learners, in saying "participating, even if it's no good and nobody cares, gives one a different sense of being in the world. 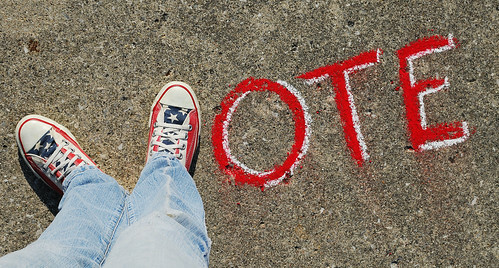 When you participate, you become an active citizen rather than simply a passive consumer of what is sold to you." I know people share concerns that there are dominant voices in online spaces; while that may be true, how will that ever change if we, as educators, don't do our part to change that status-quo? During my schooling, my voice went as far as the teacher's hand-in basket. Today, we have the opportunity to empower student voice. As for concerns about those students who live on the margins and may lack access to technology, that is even MORE reason for us to have them exercise their voice with the technology available to them at school. As Rheingold says, "The technologies that we have in our pockets today are powerful engines for participation… simply participating is a start." A "start" is all we need to influence change... and it is certainly the seed to have students discover they have a voice in the first place. This begins in schools... but if we don't embrace it, students will have a more resonant intellectual and creative life outside of school than inside it. Students deserve both environments to provide fertile soil for learning, and for those students who come from disadvantage, it is even more critical that schools are environments for rich intellectual and creative opportunities afforded by the capabilities of technological innovations and participatory culture. Furthermore, we need to enhance this participation to ignite collaboration, as "doing things together gives us more power than doing things alone." As my classmate, Vanessa, said, "Connectivity does not need to be the perpetrator; it can be a gift, but only if we do allow it be." As teachers encourage their students to get networked... they, too, must model their meaningful presence in our connected, participatory culture. Lastly, just because we live in a networked society, we cannot make the erroneous assumption that since students were born in the age of digital innovation and possess these technologies, that they are digital natives. "No one is born a native speaker of 'digital' the way no one is born a native speaker of any language". Being on Facebook or Instagram does not in any way correlate to possessing essential 21st century skills for participatory and collaborative culture. The deceiving term of "digital natives" coerces comfort into knowledge, and those are two fundamentally different things. A better term for many youth would be what David White has termed "digital residents". You can watch an excellent video that Alec Couros and Katia Hildebrandt introduced to us last semester regarding the fallacy of digital natives and the more appropriate descriptor of digital residents. 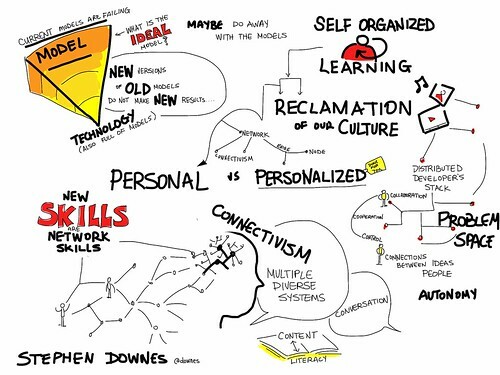 Twenty-first century skills must be cultivated in schools and educators must do their part to provide context, immersion and practice for students so that they will learn how to navigate our connected world and becoming authentic and particpatory lifelong learners. 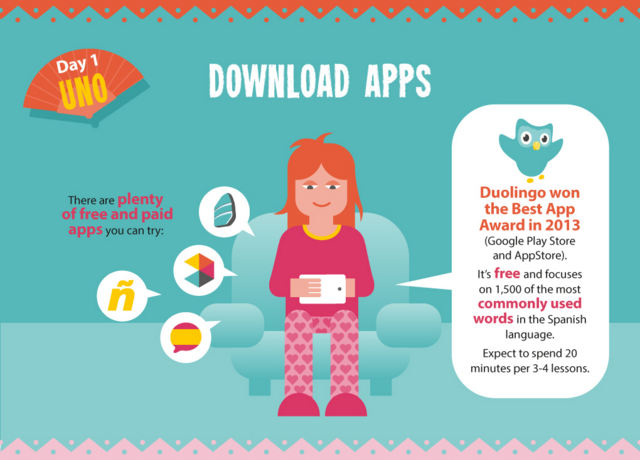 There's an App for That: Genna's Language Learning Journey Begins! ​Week One. Download apps. While I was familiar with what Duolingo was and how it worked, I had never used it for my OWN learning. Instead, I set my husband's family up with an account a couple years ago to help them with their English. The spirit of a teacher! I had all the family set up on DuoLingo to practice their English. Super fun! In the post above, perhaps I did have the spirit of a teacher (in a sense); but I did not have the spirit of a learner. Really and truly, teachers should be facilitators of learning, as well as learners themselves. In hindsight, I can see that I was unintentionally sending a message that they had something to learn, but I didn't. That evening, I should have been modelling what I was encouraging. Duolingo helps you with goal-setting, increases your vocabulary, and gets you to focus on comprehending phrases (as opposed to just singular words on flashcards). I love that when I have down time, I can practice my Spanish, as the lessons are short and sweet. I'm also happy to have connected with other Spanish language learners, including my classmate Vanessa, to engage in the social aspect of learning a language. While I am enjoying seeing a visual progression of my learning using Duolingo, I am still not comfortable speaking in Spanish, as the program offers very little to develop this. That being said, the app will definitely help people with their writing and listening, but my ultimate goal is to develop my capacity for verbal expression. I have already been seeking ways to tap into that goal as I progress on my learning journey, and you will be hearing about it in later posts. In the coming weeks, I would love to make videos of my speaking in Spanish... but that will come as soon as I feel a bit more comfortable. Below is a video of me using Duolingo. A week ago, I was both excited and overwhelmed by all the potential project ideas that were flooding my mind! A few days ago, I wrote my first post for this course, in which I had narrowed down my options to what I considered to be my top potential passion projects. After much contemplation, I have come to a decision… to improve my Spanish. My reason for taking this opportunity to learn Spanish is deeply rooted in personal connection to the language. It started when I met a "muy guapo Mexicano" while on vacation in Mexico. It may be cliché to say, but I knew I was going to marry him one day. When I first met Luis, I did not know any Spanish (with the exception of "hola", "adios", and "gracias"); however, Luis had a pretty good foundation of English, so naturally, English became our chosen language to communicate in. The more we communicated, the better Luis' English became. While I thought it would be neat to learn Spanish, I didn't pursue it at the time, as I had just moved from teaching Elementary to High School, so it was a rather busy year of planning for me. I had always prided myself on performing well in school; things always came rather easy, I performed well on tests, and always had good grades. I learned the hard way that to be good at "school", did not necessarily mean I was good at "learning". I didn't accept this reality right away, however… for a while, I let this truth deeply impact my pride. Truthfully, I became so insecure about the fact that I couldn't just pick up the language after spending hours with my workbooks. I also felt ashamed at the time that I had a university degree and was struggling with learning Spanish, while my boyfriend didn't have a day of post-secondary under his belt (he went straight from high school to working), yet he kept getting better and better at English… WITHOUT expensive workbooks! 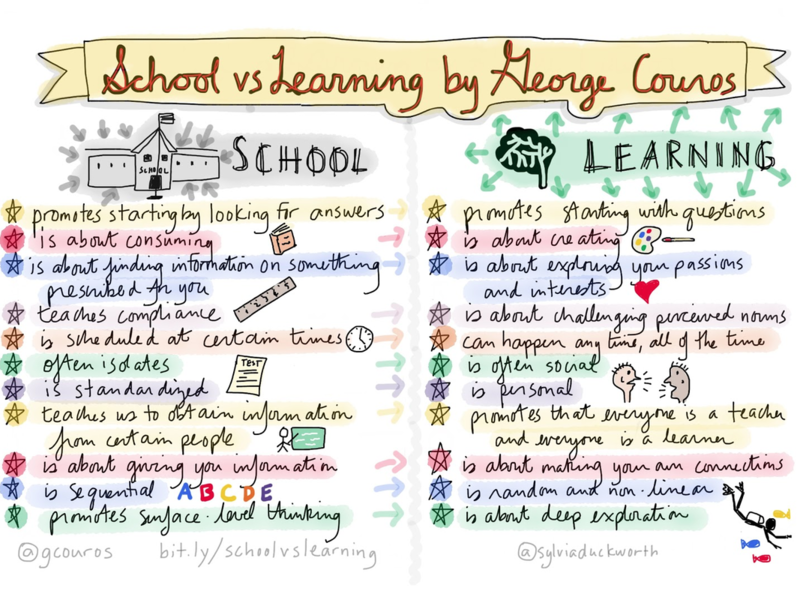 The sketchnote below by Sylvia Duckworth, based on the thoughts of George Couros, really dispels the myth "schooling" being superior. B) Do I keep a poker face... and look foolish because I'm the only one in the room that isn't laughing/smiling? Ugh… it's the worst. When my traditional, structured, sequential approach to learning Spanish failed miserably, with my pride still wounded, I changed my approach and found a crutch: Luis. Luis was not only my boyfriend, but my personal translator. The poor guy went back and forth translating everything. The problem was that I became dependent on this and he ultimately became my lifeline in Mexico. While standing on a cliff, Luis told me that he had to confess he couldn't have me as his girlfriend anymore. Let me tell you, standing on a cliff and having the love of your life telling you this, was not a good place to be! Turns out, he was proposing in his broken English! He couldn't have me as his girlfriend anymore because he wanted me to be his wife. After the initial scare and laughing about how his translation did not come out as intended [he swears to this day that it sounded so much more romantic in Spanish], I said "yes". After applying for Luis to come to Canada to visit, and being rejected twice because we (in the eyes of Citizenship and Immigration) failed to prove that he would return to his home country (even with a return ticket), the wedding needed to be in Mexico. Recently, Trudeau has committed to lifting the visa requirement for Mexicans to travel to Canada. This is great news for our family! Standing in front of a priest, it was time for me to say my vows to my husband. Since the wedding needed to be in Mexico and we got married at a local church, I was required to say my vows in Spanish… I stumbled all over them. Nerves combined with total Spanish illiteracy was quite the combination! I hope to have the opportunity one day to renew my original Spanish vows and do a good job at it! Our beautiful little girl, Mayte! Here we are now: 5 years into marriage, Luis' English is fantastic, and we are raising a beautiful 3-year-old daughter that we hope will be fluent in both languages. Right now, total responsibility for that falls on my husband, as I am (shamefully) no help. My hope is to play an active role in raising our child to be both a Spanish and English speaker. You need to know where you are in order to know where you need to go! My understanding of the language has improved little-by-little over the years, but after recently returning from a 2-week visit in Mexico during Christmas, it is becoming more and more evident that I need to invest time and effort into this. I still rely on my translators (Luis and Google), and I genuinely want to rely on them much less. In terms of my speaking... I know single words, but I cannot speak in sentences. Shamefully (I hate admitting this publicly), my speaking is terrible, and I'm actually quite self-conscious about it, which has impacted my chances to practice and improve. My learning goal is to improve my speaking over the next 10 weeks. I am ditching the "school" method and embracing the "learning" method that George Couros speaks of. My learning Spanish is going to be creative, explore my interests, ubiquitous, social, personal, non-linear, and about making connections. I notice that my classmate, Vanessa, has also chosen to learn Spanish--perhaps we can support each other a bit during this process! I came across an infographic on Pinterest the other day that inspired me (see below)! It is entitled "How to Learn Spanish in 10 Days"... for my project, I am going to adapt this to "How Genna Will Improve her Spanish in 10 Weeks". I love the ideas, and I plan to make a video hopefully each week that shows me doing most of these ideas (not necessarily in the same order). While I am feeling vulnerable and very likely to make a fool out of myself publicly, I am eager to embrace this approach to open and social learning! Back For More in 831! I'm really looking forward to another semester of learning with Alec and Katia! While I haven't made any final decisions on what I'm going to explore for my major digital project, the open-endedness of it excites me! As of right now, I'm considering an e-pal video message project connecting classrooms, taking the opportunity to greatly improve my Spanish, learning the ins and outs of photography, learning how to make quality sketchnotes like one of my fav sketchnoters, Sylvia Duckworth, or perhaps a project around connecting Catholic faith and identity to social media consumption and contribution... many options that I need to let percolate for a little bit longer before I make my decision!